Hop aromas are a major source of the different flavours in beer. Today there are some very strong intense aroma hop varieties imparting wonderful flavours coming from all over the world. Some of the most intense aromas are coming from the ‘New World,’ just like with wine. North America, New Zealand and even Eastern Europe are producing some very distinct citrus, floral and fruit-like aromas and like wine, it is the geographic “terroir” that creates the differences. British hops are unique in their complexity and delicacy of flavour which is arguably why they make the most beautiful and drinkable beer in the world. 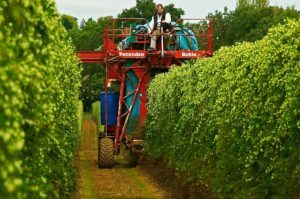 There are over 30 different varieties of hops grown in the UK and within the range there are some very intense aroma hops too, such as Target, Admiral, Bramling Cross, Jester and Phoenix. See the Hop Varieties section for more information. Hops are very similar to grapes in that they have just as many flavour profiles. Brewers in the 1970’s and ’80’s used to blend hops together to achieve ‘a consistent grist’ rather than asking just one hop to show its individual beauty and character. Single hop beers are in no way better; they are just different. Many breweries now produce single hop beers as well as beers containing a mix of hops. They are often included in a Brewer’s repertoire as monthly specials or seasonal beers.